You are here: Home » Blog » Real Food » Recipes » What to Do With All Those Summer Berries! That is my challenge right now, and perhaps it’s yours, too! Yesterday we went to a berry u-pick farm, where we picked about 20 lbs of raspberries and bought another 10 lb flat. On our way out of the farm, we noticed a sign at the farm across the street, “$1 Jam Strawberries”. I’ve never been one to turn down a good deal. You better believe I drove straight up that driveway to find out what these jam strawberries were all about. A day or two old and just a teensy bit mushed up, they were a great price and just perfect for making jam or freezing for smoothies. I bought 30 lbs. Washed and frozen about 12-14 (I’ve lost track) large Ziploc bags of both raspberries and strawberries. My method is similar to my blueberry freezing method, except that I pre-freeze on baking trays first. A photo tutorial is in the works and coming soon! 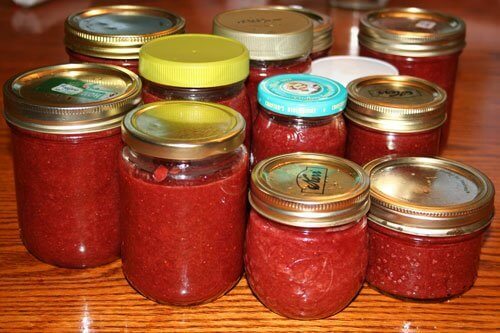 Made 12 jars of Raw Strawberry Freezer Jam (I made a hybrid of these two very similar recipes from Passionate Homemaking and The Nourishing Gourmet). Very simple and tasty! Served pancakes with strawberry sauce for breakfast and used the leftover sauce to come up with delicious Creamy Strawberry and Coconut honey-sweetened popsicles to make my dairy-free boy happy– yes, recipe is coming! The last batch of raspberries are in the process of being frozen right now… phew! Summer preserving can be a tremendous amount of work, but I try to keep it in perspective. It’s really such a short season of hard work, with dividends that keep on paying back for the rest of the year in cost-effective, nutritious and delicious foods always ready when I need them. What kinds of preserving have you been up to so far this summer? What else do you have planned? I wish we lived somewhere close to blue/raspberries…the cheapest they get it store-bought $2.50/lb…and I have to scramble to get a number of boxes before the 2 weeks are up! We live right in the middle of the USA, so it is TOO hot for them, but we were able to get a lot of strawberries at a farm. I hope to have a deep-freeze someday! we live in the same area, and I haven’t been able to find a good raspberry upick. Where do you get your berries? @Jenn, I like Krause Berry Farms, although their season is pretty much finished. I know someone who used to work there and she told me that they try to spray very minimally and use as many ecological methods as they can, but their prices are totally competitive. When it comes to u pick farms…what standard do you use about how they “stewart” their berries? I have not been able to find any organic farms in my area. I asked how they care for their plants and they do occassionally spray them to manage pests. I know it is not as much as commercial companies plus the fruit is ripened in season, but what is the compromise to make, if any? Just wondering and looking for another opinion and insight. Blessings to you! I love your attitude. YES– Keep it up! So far, I have canned 4 pints of Strawberry Jam, 7-1/2 Pints of Apricot Jam and 4 -1/2 Pints of Plum Jam. I am about to do Nectarine Jam this weekend. Our garden is slow this year, as we had a very cool spring So right now I have a lot of green tomatoes on that will prob. ripen all at once! I can usually purchase organic berries and other fruits from local organic farms (which are popping up left and right around here). If they are not certified organic, we do buy some sustainably raised berries. I think, to answer Michelle’s question, it’s important to know your farmer. Talk to him/her and get to know them and their practices. It all comes down to what you are comfortable with. Occasionally we buy non-organic because organic is not available. In that case, we wash our produce with a solution of GSE and water. We also use the Dirty Dozen List as a guide when necessary. Hope that helps! I had 30 lbs of strawberries about a month ago and I had a really hard time getting through them all within a few days – I ended up giving some away to our neighbor because I just couldn’t do them all. You doing all those strawberries and raspberries too, and dealing with your family and homestay students, and posting about it. I really don’t know how you did it?! I guess I am just in a season of having a really hard time getting things done when my little ones are awake – they are into everything, and require a lot of attention/supervision from me. I’m just not able to steal time away in the kitchen as much as I would like right now. Yay for berries! We picked 45 quarts of strawberries a few days before vacation…since we were told with the heat they wouldn’t last. Phew! It literally took me and my 4 year old (who picked straight for 3 hours because she wanted to…crazy! I left toddler and husband at home) 9 hours (well only I did the processing and driving) to pick for 3 hours, drive there and back, and process them into the freezer. I got home to a message that the raspberries are ready at a friend’s place, and its also wild blueberry season just starting. You’re right its very busy. I find that I can’t possibly tray freeze that many at once, and so after washing, I towel dry as much as possible, and freeze. It works fine for us, we just bang it on the counter to seperate them. I can’t re-use those ziplocs, but it would take far too long to tray freeze 45 quarts (it was just over 50 lbs) so that is how we do it. We go to a local farm that minimally uses sprays. For us, its the ONLY option. I would rather buy from them since its local and I at least get to talk to the farmer (AND get a better deal) then buy them at the store. I also have to put up with really weedy picking…but hey that means less spray! Its also fun to “find the berry” in the weeds LOL. Our grocery store rarely carries ANY organic strawberries and if they do (I’ve seen them a handful of times) they aren’t in good shape as they are shipped long distances from California. I wash my strawberries well, and forget about the rest. I can’t possibly do everything, even though I would prefer organic. I know they are on the “dirty dozen” list but this is the best I can do. I think its better than no strawberries at all! Our grocery store doesn’t even carry any frozen organic ones at all. @Nola, Oh I also wanted to say that I do wonder if the “dirty dozen” doesn’t take into account that things are grown in different places. I would think, in theory, that strawberries grown in the US or Canada would have less sprays (and not the outright banned ones) compared to say, Chile. Also, I would think that smaller farms (like u-pick ones) are better since they, in theory, wouldn’t afford the amount of sprays that bigger companies can (that grow the grocery store berries). I don’t know. I’ve always wondered. Like when they make that dirty dozen list, how do they tell the difference between an apple from Chile, one from New Zealand, one from US, one from Canada. I know it also has to do with the skin on the veggie or fruit and such and the absorption it can do, but you’d think there would be differences. Just a thought. @Nola, I agree. I think that’s probably true, although it’s difficult to know for sure. But it’s something I wonder about when the make the lists, and I am sure that the different factors you are talking about affect the amount of sprays and chemicals left on the produce. And I think that’s why local is a great choice if you can’t get organic (or even sometimes if you can). So don’t feel bad about your local berries- at least you know the farm! @Stephanie @ Keeper of the Home, That makes total sense. And your life is sometimes perfect?! LOL just kidding. I am wondering about washing raspberries though. Is there a better way to not make them mushy and fall apart? Mine that I am getting are not sprayed but they are near fields that I know are sprayed (they’re on a non organic farm with fields nearby). @Nola, I was wondering about this too, because when my hubs got our strawberries he asked about whether or not they had been sprayed and the farmer told him no, but that they spray them in the fall with a fungicide, to help with the spring crop, but that he doesn’t know any one around here (I am in northern Indiana and the berries were from Michigan) that sprays their strawberries in the spring. So I felt good that they were local berries that had not been sprayed, even though they were not organic. It makes me think that the dirty dozen list must just take into account conventional berries from industrial farms where they mass produce berries and that is why they have to use lots of pesticides – and that is not the same as family owned and run local farms. Just my thoughts. I’ve only got 7 batches of strawberry freezer jam and one batch of strawberry-rhubarb freezer jam done – more of both in the works. As my pneumonia and PPD loosen up on me a bit. 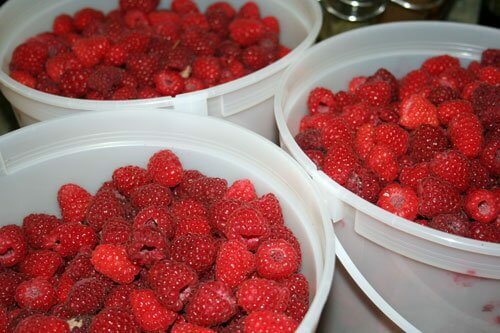 Then it’s raspberries and tayberries and on and on and on. Sigh. Hey Stephanie, thought I would pass along my blueberry source in case you need another, as I’m sure you already have one. This weekend I picked blueberries from a local farm, for .80/lb. We have been going to this farm for a couple years now. A nice old German man runs the farm and doesn’t spray after the bushes have blossoms on it. He is quite proud of his farm and loves to talk about his work, which he does all by himself, and he is in his 80’s! I haven’t found a great source for berries yet, which I NEED to do. Because blueberries, my kids go through them like crazy. I need to find a good source and freeze them! The problem is, right now I can get a lb. of wild blueberries at Trader Joe’s for $2/lb and local u-pick ones are $2.50/lb minimum plus they’re sprayed. Not going to pay more for something not as good!! But I have gotten a lot from my CSA so I’ve been chopping and freezing a lot of kale, basil (drying that), squash, peppers, beans and also made some pickles recently. Fermented food, yummy! I’m happy about my freezer stash so far but I’m just waiting on the tomatoes and apples to come in to get seriously canning in my kitchen!